Input text: There is a purple man 4 feet in front of a first wall. the purple man is on the ground. The first wall is [texture]. On the left of the first wall is a second wall facing right. The second wall is [texture]. On the right of the first wall is a third wall facing left. The third wall is [texture]. On the left of the man is a small guillotine. The guillotine is 1 feet in front of the man. Behind the guillotine is a 2.5 feet tall boy. The boy is 1 feet above the ground. The boy is 0.5 inch in front. The boy is on a small box. 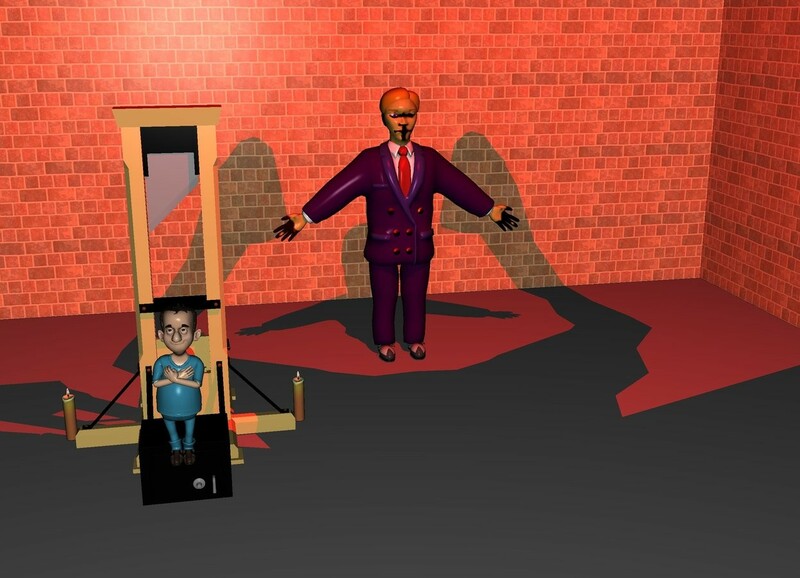 The box is in front of the guillotine. 4 feet in front of the purple man is an enormous bat. The bat is 10 feet above the ground. The bat faces down. Above the bat is a big red light. it is night. On the right of the guillotine is a first big candle on the ground. On the left of the guillotine is a second big candle on the ground. I'd never noticed the face of this man before. He makes a good joker. Love the bat shadow!